Have you ever met someone with such a perfect smile in Englewood, OH, you weren’t sure you could believe it? You may be wondering how you, too, can acheive a perfect smile. The answer is easy: get a smile makeover! Using the latest smile design technology and techniques, we can give you a smile makeover that may mean you will never want to stop smiling! Tooth Properties — including the shape, size, length, width, angle and ratio. Facial Structure — for example: square, round, trapezoidal or otherwise. 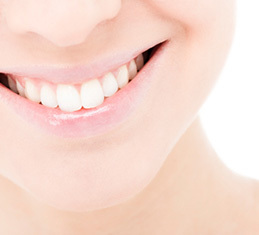 The Mid-Lines — of your gums, lips and face. Tooth Shade/Color — to best complement the color of your skin, eyes and hair. Age, Weight and Gender — to determine correct proportions relative to teeth size. We’ll page through magazines, catalogs and old pictures of you to determine just the right look for your perfect smile design and smile makeover in Dayton. Once we discover the perfect smile “formula,” we’ll create a wax mock-up of your teeth to give you an idea of how we might change them. Our lab will create provisionals, and we give you a few weeks to make sure they fit correctly and look right. We then create and place your permanent porcelain veneers (custom, ultra-strong, fingernail-thin wafers) over the front of your teeth to enhance your smile and repair any damage. In this way, your smile makeover and smile design can give you a perfect smile in Dayton! Conservative Dayton dentistry techniques continue to evolve, requiring less and less removal of tooth structure. Call Drs. Louis and Dominic Vitangeli and walk out the door with your new perfect smile — sometimes in only two visits! Afterward their smile makeovers, our patients often find it difficult to hold back their excitement. A bright new perfect smile can enhance your personal confidence, open up your personality, improve your personal and professional relationships and make you happy and ready to smile with a smile design in Englewood, OH! Experience the confidence that comes from being comfortable with your own perfect smile. Call us to schedule a free smile design and smile makeover consultation using Englewood, OH cosmetic dentistry.